Last week as many of you will know was International Women’s Day #IWD16. A great day for women all around the globe to focus on ourselves as women, our achievements, our accomplishments and on the way still to go. On this day I was lucky enough to be working with an amazing group of women considering our bold steps……. The numbers of people didn’t bother me, I love groups, it’s where I feel comfortable, the more the merrier as they say. It was the 20 minutes that I was a bit more unsure about – 3 hours no problem, a day or two much better, but 20 minutes? Added to which we were going to be doing this in a church (seat layout, acoustics etc all very much not my idea of a perfect venue) and there would most definitely be children! The “take your children” ethos is what makes this networking group special and different. And it works, I’m a regular, although have to confess I left my son at nursery on this particular day. So before the day had even begun I was feeling a bit bonkers, rather brave and decided to boldly grab the challenge and see what happened. In actual fact, if I’m really honest it was using a microphone that terrified me the most. Take a large echoey church with a lot of people and you do kind of need it. But this was a first for me, I like to wave my hands around, I have bits of card to play with, how was a hand held mic going to help…..
Actually it all turned out rather well. I ended up loving the mic – there’s a strange attraction to having your voice amplified above everyone else’s! We worked in and around the rows of seats in the church and were creative with our space. I proudly employed some facilitation techniques to work with rather than against the short time span and came up with a workshop that (if you like to know about these things) was a Focused Conversation done in a Scrum facilitation (the standing up speedy bit) meets World Cafe Style (the moving around and sharing bit) style. We did a couple of stand up rapid brainstorms which involved moving and changing groups, followed by a decisional level creation of bold steps. What does the word “bold” mean to you? What does it feel like to be bold? What is a bold next step that you would like to take in your business? The last question, the creation of the bold steps was what I really wanted people to take away from the workshop. 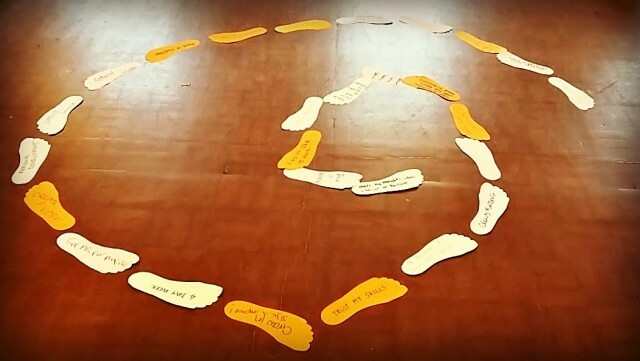 We all wrote our ideas on foot shapes and arranged them in a spiral. This is a shape that denotes growth and evolution, shows how we want to move forward and keep expanding, is dynamic and can continue infinitely. And it was inspiring to watch the collaboration as everyone created the spiral together. Some of these ideas were specific and practical and some were more related to personal and business development. But they each denoted a step forward, something bold that we want to do to get further along. And as we all know, we need goals to give us direction and focus and whether those steps towards those goals are giant leaps or tiny baby steps they are all part of our movement and development. 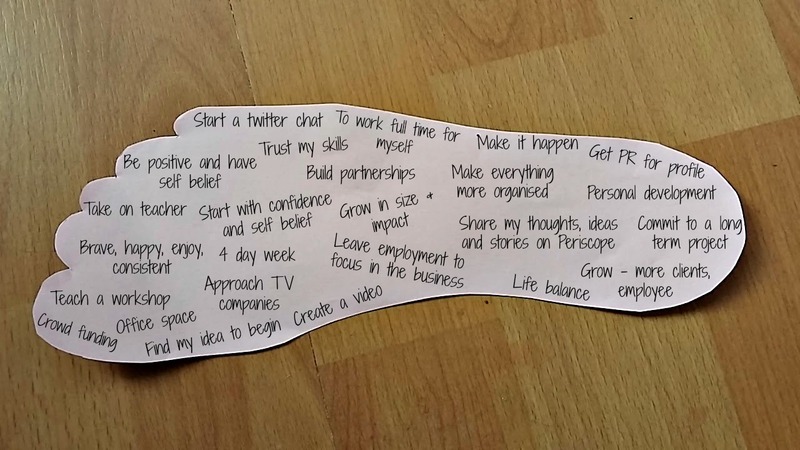 It’s great to see we have so many aspirations, desires and ideas to keep going and keep improving. Which is a large part of what International Women’s Day is about. And what was my bold step? Well mine was to write an e-book, so watch this space! What are your bold steps? If they are about doing workshops, then please give me a shout…..